What if you could change your friends' lives and loves through the settings of a computer game...? Lex Murphy's group of friends have all dated, hated, ignored and lusted after each other for the last few years. If only there was a way of matching people perfectly to avoid all the unrequited love, dumping and drama! Then Lex's friend George is given a mysterious Sims-like game by his software-testing dad which involves building character profiles in the categories of Life, Looks and Love. Lex and George populate the game with avatars for all their mates, making a few 'wishful thinking' adjustments to the settings - and find that the next day these tinkerings have come true! But how long can this new calm, loved-up atmosphere continue? This book was an absolute joy to read. I don't often say that as I'm hard to please when it comes to books, but this one really was brilliant. I couldn't put it down once I'd picked it up, meaning that I read the full thing in a day. :P If that's not a sign that I liked it then I don't know what is. I had no idea what to expect before I submerged myself in this novel; I'd only ever skimmed through the blurb and hadn't read any reviews or discussions prior to reading it. This meant that I didn't really have any expectations apart from knowing that I would like the writing style, as I had read a couple of Luisa Plaja's books before. I'm glad that I didn't know very much about this book as I believe my reading experience was enhanced because of this. 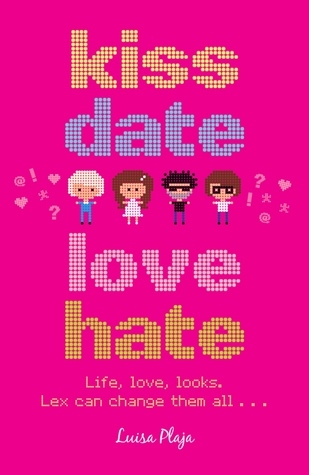 'Kiss Date Love Hate' is a perfect book for any teen girl who wants a light-hearted, quick read, that allows them to escape and be sucked into a surreal, dreamy world. The writing style is very easy to read and every character is well formed, unique and lovable in their own way. I would say that my favourite character was Lex as she was very gutsy in the book which made me grow to admire her as I read, but I also really warmed up to Drew as I got further in. I really like his bad-boy persona and found myself looking forward to any part he was involved in. The plot was incredibly smart and very original which made me enjoy it even more, and unlike some other books with amazing, unique plots, I wasn't at all disappointed with how it was done. I think that the idea was played brilliantly and I don't see how Luisa could have made it any better. Overall, I think that this book is the perfect read for a rainy weekend or a relaxing holiday for any teen/tween girl. Great review! It sounds awesome! And i agree with you on the fact that two blogs are difficult to manage at the same time! You end up neglecting one, usually the old one like i am doing. My new one is uniquely girly. And hey, great layout and design! I had absolutely no idea Luisa Plaja had also written this book!! I think I was out of the book blogosphere at this point. It sounds really good! May have to go and check what the prices are.... thanks for this review! Summer Reads - My Book Cupboard!